Suckers come in five different flavors. 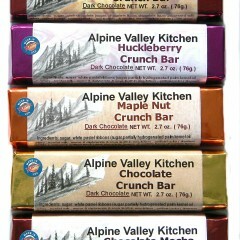 Choose from huckleberry, cherry, root beer, orange or butterscotch. Round or bear suckers weight 1 oz..
Huckleberry jam at its finest. We capture that great unique huckleberry flavor in every jar. 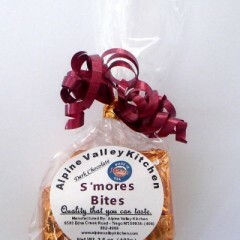 Great on ice cream, sandwiches, or biscuits. Each jar is shrink wrapped sealed. This roll is shaped like a bear claw. Has a huckleberry filling for that great huckleberry taste. Made with the same dough as our other rolls. These ship really well. Put them in your microwave and they will taste like they just came out of the oven. Mmmm. 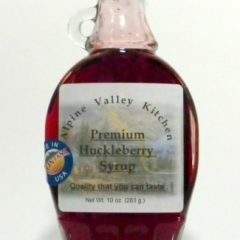 Huckleberry Syrup is made with huckleberries but with pulp strained out. 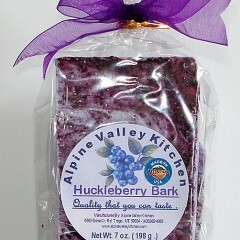 If you want huckleberries left in, try our Huckleberry Topping. Bottled in traditional syrup bottles or our 16 oz. economical round bottle. More information below. Topping is made especially for ice cream, cheesecake, french toast and the like. 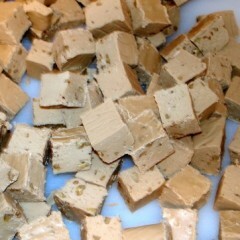 It is thicker than our syrups and is processed with the fruit left in. 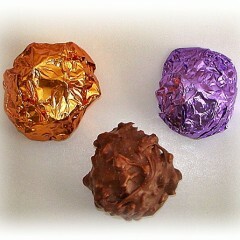 Truffles are made with our special rich creamy silky centers. 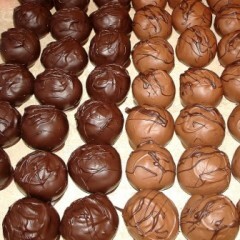 They are hand dipped in either milk chocolate or dark chocolate. 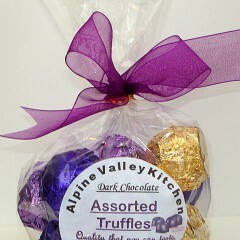 Not to many can resist the temptation of a delicious truffle. For those that like jelly instead of jam. Jelly does not have the fruit in it. Fruit is strained out during processing where as jams have the fruit left in. We only carry one size and flavor. 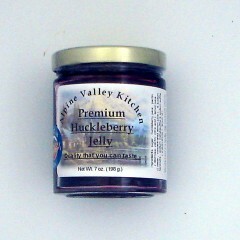 Huckleberry jelly comes in our 7 oz. size. 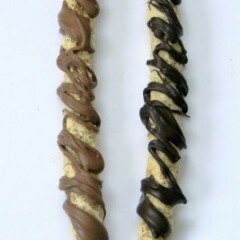 Flavored bark with special mixture swirled on top. 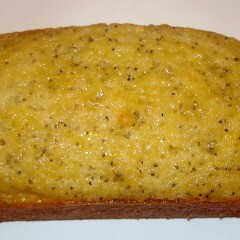 If you like huckleberries, you will love enjoy this delicious special pound cake. 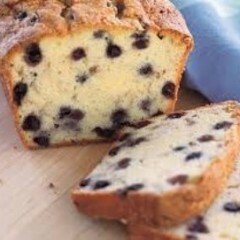 Our huckleberry pound cake has huckleberries through out. 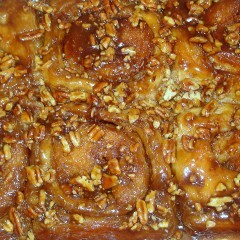 Topped with a slight tasting lemon glaze. Loaves are approx. 3″ x 4″. 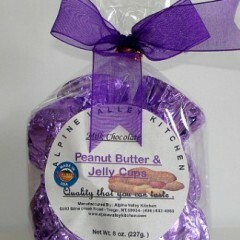 This is a delicious alternative from our peanut butter cups. These have the same peanut butter filling with an added layer of huckleberry jelly. Each piece are foil wrapped. Choice of milk or dark chocolate. 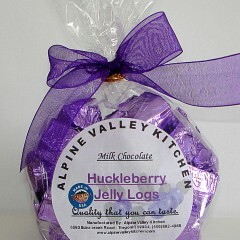 Huckleberry Jelly logs are molded in the shape of a log. They have a huckleberry jelly type center. 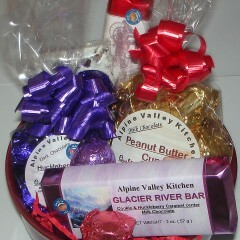 Each piece is individually foil wrapped. Choice of milk or dark chocolate. 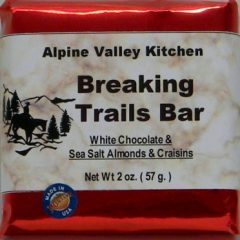 1 – Sea Salt Almond Bar 2 oz. 1 – Wagonmaster Bar 1.6 oz. 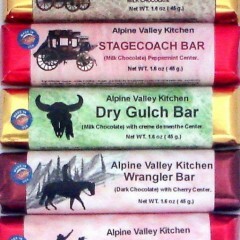 1 – Wrangler Bar 1.6 oz. All sacked in an attractive bag. 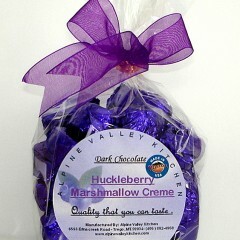 Huckleberry flavored marshmallow center make this a popular choice. Each piece are individually foil wrapped. Packaged in an attractive bag. Choice of milk or dark chocolate. 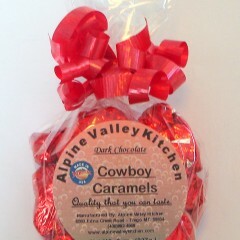 For those who like the taste of caramel but can not chew regular caramel, these are for you. 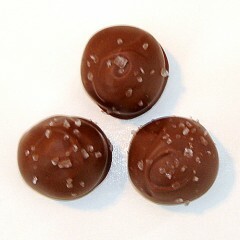 Chocolate on the outside with soft caramel centers. Choice of chocolate. Each piece are foil wrapped. 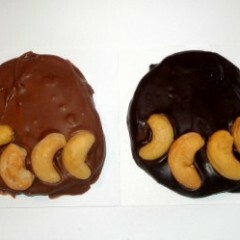 Chocolate with chopped peanuts enrobe a creamy huckleberry or peanut butter center. 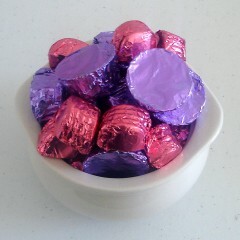 Each piece is individually wrapped in purple or copper foil. Choice of milk or dark chocolate. Sacked in an attractive bag. 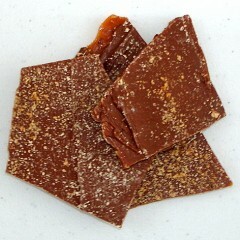 This Almond Toffee is thin enough to bite easily off. 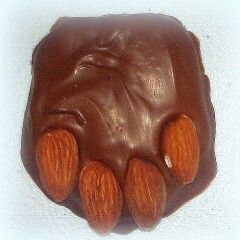 Has a layer of chocolate on both sides and sprinkled with chopped almonds. Two sizes to choose from. 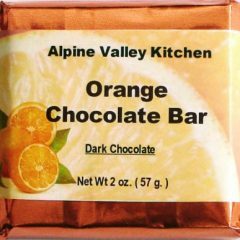 Orange Chocolate Bar has a nice orange flavor to it. Taste similar to those orange jelly sticks that most of us love. Choice of milk chocolate or dark chocolate. 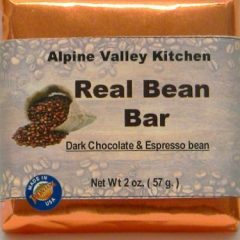 Real Bean Bar is a break apart bar that has 9 cavities. Each cavity contains 2 dark roasted espesso beans. Your choice of milk or dark chocolate. Robust in flavor. This is a 2 oz. size bar. 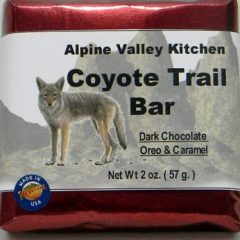 Coyote Trail Bar comes in your choice of chocolate. 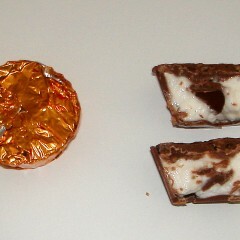 Chocolate has a mix of caramel and oreo pieces in it. This bar is 2 oz. in size. Simply delicious. 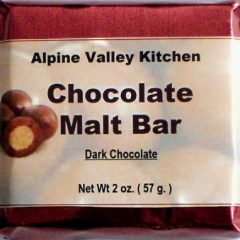 Chocolate Malt Bar has a delicious malty taste. This candy bar is made with chunks of malt ball centers mixed in. Delightful malted taste. This bar weights 2 oz.. Choice of milk chocolate or dark chocolate. This chocolate bar is just what name implies. 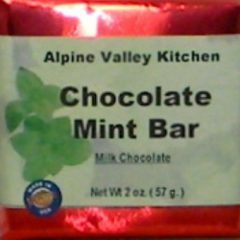 Chocolate with just right amount of mint. Fresh minty taste. Choice of milk chocolate or dark chocolate. 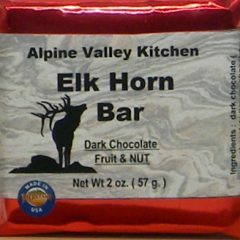 Elk Horn Bar is a fruit and nut chocolate bar. This bar is 2 oz. in size. Cup Of Montana have an almond flavored marshmallow center. Chocolate outside with toasted coconut in chocolate on top. They taste similar to Cup Of Golds. Choice of milk or dark chocolate. Each piece are foil wrapped. 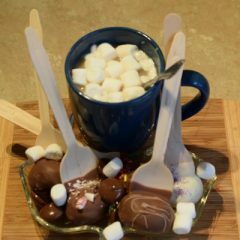 Hot chocolate spoon. Simply stir your delicious spoon into 8 oz. hot milk. Stir until chocolate melts. Enjoy! 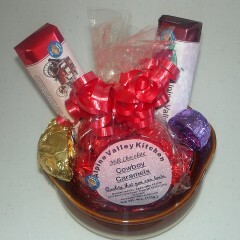 These candies are packaged in a white pottery bowl. 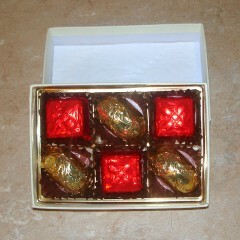 Chocolates - Our chocolate and candy business started in 2005. Located in the small community of Trego in the far northwestern corner of Montana. Our goal is to turn out some uniquely made products that are different from others. Our products not only look good but also taste good. 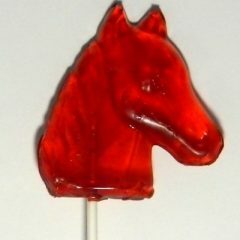 Be sure to check out our Chocolates and Candies section for a wide selection of treats like our "Western Series" Candy Bars. 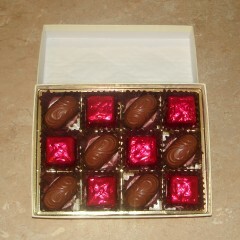 Most of our chocolates are available in milk or dark chocolate. 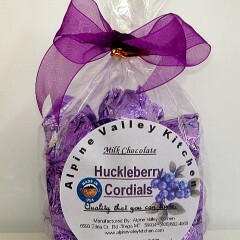 Also we make a variety of chocolates and candies with huckleberries, which are abundant in our area. 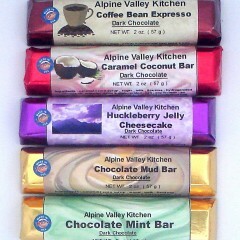 Some of these products include our Huckleberry Crunch Bar, Huckleberry Jelly Cheesecake. 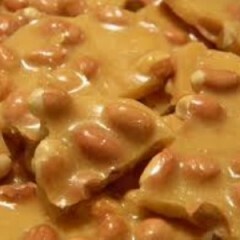 Go here for a full list of huckleberry products. Our Huckleberry Jam is easily spreadable. 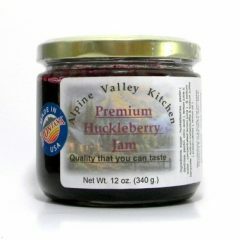 Huckleberries are left in jam as compared to our huckleberry jelly. Jam comes in three sizes. 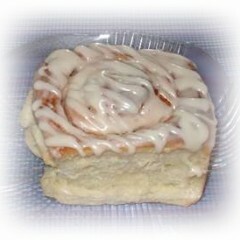 Sizes are 5 oz., 7 oz., and 12 oz.. Great on toast, pancakes, hot rolls, muffins, and french toast. 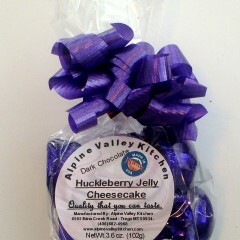 Only one size is available for Huckleberry Jelly. Comes in a 7 oz. size jar. 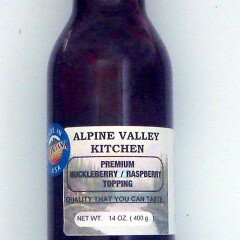 Huckleberry jelly is made with huckleberries yet pulp is strained out. Jelly is thicker than jam. Very good on peanut butter and jelly sandwiches, hot rolls, muffins, and bagels. 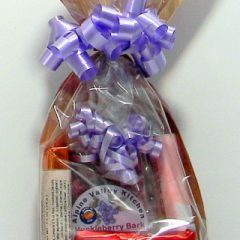 Our Huckleberry Syrup is made with juice from huckleberries. Pulp is strained out. Syrup is bottled in two different size bottles. The 10 oz. size is bottled in syrup jar with handle. Then our 16 oz. size is same shape. For a more economic value, try our 16 oz. round bottle. To view bottles go here. Try some on pancakes, waffles, and french toast. Huckleberry Topping is thicker than our syrup. Huckleberries are left in and not strained out. Toppings are made for ice cream and cheesecake. Its great on other desserts also. 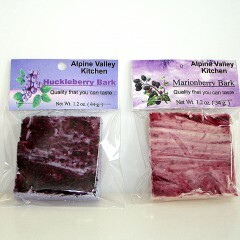 We also have an excellent huckleberry/raspberry combination. Shake well before using. 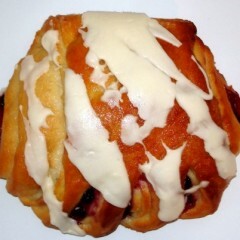 From our Bakery, we offer some of our best selling baked goods.